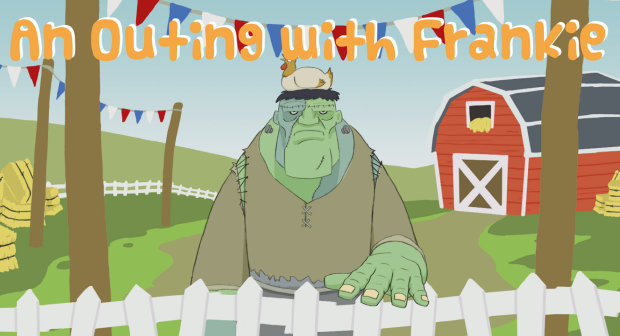 Frankie’s having a visit to the petting zoo! Look at all the cute animals! Frankie sometimes finds it difficult to control his own strength, but I’m sure he’ll do fine! Dave made this with a bunch of friends over 72 hours for Ludum Dare 33. The theme of the jam was “You are the monster”. We couldn’t make Crawl again, so we made this! We recently went to GDC and shared a tiny hotel room with @sunraheadgear. We had stocked up on milk to breakfast on and keep our bones in good nick, but discovered much to our chagrin that the room had no bar fridge. There was a ice machine in the hall, broken, but bearing a sign which directed us across the street and up some stairs to it’s functioning twin. Thus began a nightly ritual of vineing ourselves collecting ice to maintain optimum milky temperatures. See the full story here, vines and all! Back in 2002 I discovered a nifty tool for making classic point and click adventure games called Adventure Game Studio. AGS got me hooked on making video games, and it’s all I’ve wanted to do ever since! 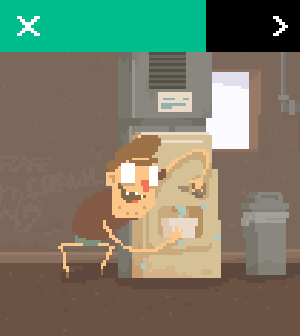 The Unicated was my most recent little adventure game. Although it was a couple of years ago now. I made it in a month for a little competition where the theme was “Evil Twin”, the music’s by the talented @sunraheadgear with voices by the irrepressible Mr. Adrian Vaughan. A short twisted tale about conjoined twins; one good, one evil. Can they learn to work together before they’re literally torn apart? We made a game over the weekend for Molyjam! Molyjam is sweet- get hardly any sleep, eat M&Ms for breakfast, and make a complete game in a weekend! This year the deal was to make a game based on a real quote from Peter Molyneux. We got together with a bunch of friends and made a not-creepy “Boy Bonding Relationship Simulator” inspired by this Molyneux TED talk, and the whole Milo concept in general. Just like a real boy! PLAY THE GAME IN YOUR WEB BROWSER NOW! So I’ve been spending Fridays trying out little random ideas, some of them for Crawl, and others are just little one off game experiments. These prototypes are all very rough and unpolished but maybe interesting from a purely academic standpoint. They’re fun to make in any case! The year is THE FUTURE. As a lowly taxi driver, you can’t afford the rent on your tiny apartment in Cititropolis, let alone support your family. Unless… you could complete multiple fares AT THE SAME TIME USING TIME-TRAVEL BECAUSE YOUR TAXI ALSO IS A TIME MACHINE! The idea’s that you’re a dude that can’t shoot but you use the enemies bullets against them. Basically just wanted an excuse for lots of homing missiles. So just survive as long as you can (probably not long). My high-score (KELS) is 23, although it’s highly dependent on how many turret ships you get.